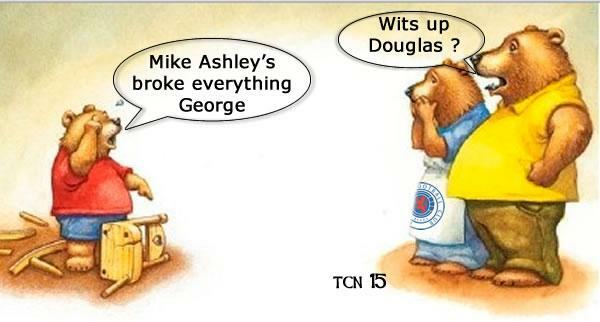 Sevco fans are in full protest mode against Mike Ashley now that the teddybears are getting their pitch nicked and The Three Bears have had their porridge well and truly stirred by the Sports Direct supremo. After years of keeping their powder dry and engaging in acts of war on their keyboard and in their feeble-minds, they’re now getting serious. And even more mad than their usual perma-raging stage. This time they mean business: they’re going to destroy Ashley . . . by verse. Here are some of the some of the more refined suggestions from those lyrical maestros on the ‘Swallow Swallow’ website (they’ll swallow anything those mutants). There are two points to keep in mind: these are serious suggestions and not all of those making the suggestions reside in the State Hospital at Carstairs. Be afraid. So get out of our club. I’d be up be for those outside singing.